We’d love your help. Let us know what’s wrong with this preview of The Keeper by A.G. Henley. He knows Fennel’s Sightless. He knows that means the Scourge can’t hurt her while she gathers fresh water for her people. He knows how to wield his bow and arrow to take out the revolting flesh-eaters when they swarm around her. He’ll motivate her, distract her, do anything he can to keep her working Peree knows what he’s doing as the new Keeper of the Water Bearer, Fennel. This companion story to THE SCOURGE (Brilliant Darkness, #1), a 2013 Next Generation Indie Book Award finalist, stands alone for new readers and allows series fans a glimpse of the first few days of Peree and Fenn's relationship from Peree's Lofty point of view. 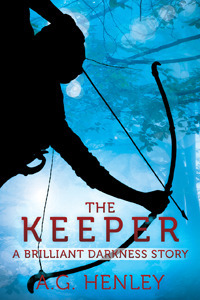 To ask other readers questions about The Keeper, please sign up. I loved Peree's POV of the first chapter of the first book. We see his struggles and his confusions of doing what is best for his people but also what is best for the Water Beaer, Fennel. he knows he must hate the Groundlings, his been told all his life. But the more he observes Fenn, the more fascinated and impressed he is with her. Her courage and bravery he admires, despite being sightless, she walks with such grace that he can't help but stare at her and her beauty. yet he risks angering and I loved Peree's POV of the first chapter of the first book. yet he risks angering and losing the trust of his people but it seems he worries more losing the trust of Fenn. Let it be known that I love his POV 10000000000000000x more than hers. Although this short story comes chronologically after the first book in the “Brilliant Darkness” trilogy, it can be read as a standalone – which is how I read it. It is a lovely tale of love overcoming the prejudice incited by years of tradition and separation of two tribes – a bit like Romeo and Juliet, but so far without the tragedy or major violence. For me it was a compelling introduction to the trilogy, and I made sure that I bought the first book in the series as soon as I finished this ta Although this short story comes chronologically after the first book in the “Brilliant Darkness” trilogy, it can be read as a standalone – which is how I read it. It is a lovely tale of love overcoming the prejudice incited by years of tradition and separation of two tribes – a bit like Romeo and Juliet, but so far without the tragedy or major violence. For me it was a compelling introduction to the trilogy, and I made sure that I bought the first book in the series as soon as I finished this tale. The setting is a post-apocalyptic future, where the remaining humans have been divided into the symbiotic, but separated tribes of the Lofties (tree dwellers) and the Groundlings (ground dwellers), who reluctantly work together to fight and oppose the diseased, maddened, flesh eating Scourge. Peree is a Lofty, and he falls hard for the Groundling Water Bearer, Fennel. He must protect Fennel, while she carries out her duties, but tradition dictates that is where is relationship with her should end. It doesn’t take long for Peree to have other ideas. I liked the world created in this book, and the well-thought out characters that populate it. I am definitely looking forward to reading more. "Suddenly the choice is easy. I choose her." This novella is told entirely on Peree's POV and although it was great to be on his mind, I admit I'm still a bit disappointed, because I wanted more! I wanted his POV is some crucial scenes ahead in the story! All that angst and romance! Anyway, still it was nice to read the beginning of the story and his impressions of the Groundlings. This is a novella from Peree's perspective. It gives a unique insight on what it's like to be a lofty. I first got into this series in the Shatter Worlds Box Set (Which I wholly recommend you buy and read) in The Scourge. That is most definitely a book you want to read if you're gonna get into this series. It begins there then continues in The Defiance. You will LOVE this epic series, which is unlike any other I have found so far. This is my first reading of anything written by A.G. Henley. I liked how her characters were presented, and I enjoyed the slight romantic vibe between these two adolescents while they were performing the tasks expected of them to help benefit their individual societies in this post-apocalyptic world. I look forward to reading more from this author and getting to know the characters in this series better. Good short from Peree's POV. Since I had just finished the first book, The Scourge, everything was still fresh and it just added to the story and explained a couple things about him. I received a book in exchange for an honest review. I love tis it gives his point of view. I’m not super into the end of the world/zombie genre but this was a good introduction novella nevertheless. If the author writes anything different I might give it a shot. cute little novella from peree’s perspective of when he meets fenn! Peree’s job is to protect sightless Fennel, shooting arrows at the horrifying flesh-eaters from high up in the trees as she collects water for the community. She is the person chosen to collect water because being sightless, the flesh-eaters can’t hurt her. Peree’s job is not so much to protect her as it is to insure a continuing supply of water for his people. But, he slowly falls in love with Fennel. This is a five-star, truly great book. Henley paints beautiful pictures with her words from the Peree’s job is to protect sightless Fennel, shooting arrows at the horrifying flesh-eaters from high up in the trees as she collects water for the community. She is the person chosen to collect water because being sightless, the flesh-eaters can’t hurt her. Peree’s job is not so much to protect her as it is to insure a continuing supply of water for his people. But, he slowly falls in love with Fennel. This is a five-star, truly great book. Henley paints beautiful pictures with her words from the first page. Many times an author works and reworks the first few pages of a book so the prose is exceptional on those pages but the writing quickly deteriorates afterward. The writing in The Keeper is exceptional throughout. What am I going on about here? The writing is never my focus. I love a good story and was not disappointed in that regard for a second. Flesh-eaters? Yuck! I don’t usually love horror. It’s like going for the cheap thrill. But, this book was not about horror. It was about the relationship between two communities balanced precariously, on the edge of war, between the lofties, who lived in the trees, and the groundlings. The real story is how Peree starts out watching Fennel, fascinated by how she manages, being sightless. Then, he must protect her and make sure she is able to collect the water. He tells her stories, challenges her, whatever he needs to do. In the process his feelings for her grow, until he no longer just wants to protect the water supply for his community. He falls for Fennel and wants to protect her. What I loved about it: Fennel is not some fragile, incapable blind person. She’s tough. Even though she’s afraid, she’s brave. She’s an admirable heroine. What I didn’t love: It was only 45 pages! I was so impatient when I was looking for a book to read I only looked at the cover and the description, missing the important info that The Keeper is a novella. The Keeper by A.G. Henley, author of The Scourge, a finalist for the Next Generation Indie Book Award: Peree knows his duty as the new Keeper of the Water Bearer, Fennel, is to make sure his people get every drop of their share of the water she collects when the flesh-eating Scourge roam the forest. He will motivate her, distract her, do anything he can to keep her working. He knows his duty is to his people and his people alone. What he doesn’t know is that he's falling in love with her. MY REV The Keeper by A.G. Henley, author of The Scourge, a finalist for the Next Generation Indie Book Award: Peree knows his duty as the new Keeper of the Water Bearer, Fennel, is to make sure his people get every drop of their share of the water she collects when the flesh-eating Scourge roam the forest. He will motivate her, distract her, do anything he can to keep her working. He knows his duty is to his people and his people alone. What he doesn’t know is that he's falling in love with her. This novella is set in a kind of cave man type of era. There are three main races. The Groundling's who live on the ground and have control of the water. It is a sightless Groundling who has the job water bearer and collects the water. The Loftie's who live in the trees with wooden planks between the trees for walk ways who protect the water bearer from the Scourge, they are called Keeper's. The Scourge are kind of like zombies, but they bite and kill so are feared. However for some reason they cannot touch a sightless person, which is why a sightless Groundling is the one to collect the water. A new water bearer and new keeper are chosen and the novella tells us about their burgeoning relationship. . . are they even allowed to have feelings for each other? So did I enjoy this novella? Yes, I did. Would I like to read the series/more by A.G. Henley? As I already have The Scourge I will definitely be reading it. The Keeper by A.G. Henley is a fantastic snippet into Peree’s POV for those who needed more after The Scourge. Set during the first part of the book and leading up to just before Fenn’s surprise, I found myself falling for the Lofty boy a little more as I read. Peree is a bit of a mystery at the beginning of the series. I loved seeing his initial meeting with Fenn through his eyes. This is a boy who fell head over heels for a girl who he shouldn’t. And I love that that doesn’t stop him. And his r The Keeper by A.G. Henley is a fantastic snippet into Peree’s POV for those who needed more after The Scourge. Set during the first part of the book and leading up to just before Fenn’s surprise, I found myself falling for the Lofty boy a little more as I read. Peree is a bit of a mystery at the beginning of the series. I loved seeing his initial meeting with Fenn through his eyes. This is a boy who fell head over heels for a girl who he shouldn’t. And I love that that doesn’t stop him. And his relationship with Shrike is expounded here as well and I felt myself tear up just thinking about how close they seemed. For Peree being the Keeper means that he must protect the Water Bearer. If he fails his people go without water. The leaders of his community remind him that he isn’t a keeper of the Water Bearer but a keeper for his people. He protects them by ensuring they receive their fair share of the water. This is a concept Peree struggles with. He’s been watching Fenn for years as they’ve grown up, hoping to one day be the Water Bearer and now that he is he finds that he is more concerned with her safety than that of his people. It creates a conundrum for him, one he attempts to find a solution to in this short novella. This is a short story about two peoples...one who lives in caves and another who live in the trees. A third group...some kind of monsterous creatures called the Scourge lurk in the forest and try to kill everyone. Only a sightless water fetcher can get water for both peoples without being attacked. The Keeper is from the trees and charged with protecting the water fetcher. I found the world building to be great and the story very intriguing. This is a dystopia as it is set after the fall of our This is a short story about two peoples...one who lives in caves and another who live in the trees. A third group...some kind of monsterous creatures called the Scourge lurk in the forest and try to kill everyone. Only a sightless water fetcher can get water for both peoples without being attacked. The Keeper is from the trees and charged with protecting the water fetcher. I found the world building to be great and the story very intriguing. This is a dystopia as it is set after the fall of our civilization, but there is a lot of fantasy elements here too and mystery...like why the water fetcher is protected from the scourage. There is a bit of a connection between the keeper and the water fetcher, and no doubt a romance is brewing...which I am interesting in seeing in future stories. The only negative I would mention (and it isn't much of one) is I have no idea what the Scourge people are....how they became what they are, how they seem to have unlimited numbers, why their primary goal seems to be attacking people, etc. I'm sure a lot of that is covered in the other books, but I haven't read them yet. The mysteries and questions from this book only make me more interested in reading the other books, which I am looking forward to doing. Peree also gives us an invaluable view of the Lofties and what life looks like for them, further establishing the idea that the Lofties and the Groundlings are two groups of people who fierce I already LOVE Peree, and now getting to see the beginning of his and Fenn’s story through his eyes, I love him even more. Peree also gives us an invaluable view of the Lofties and what life looks like for them, further establishing the idea that the Lofties and the Groundlings are two groups of people who fiercely care for their own, who are acting on years of presumptions and prejudice (but who both grudgingly need each other), and how those prejudices have affected both their groups. Having now seen both sides, it makes Peree and Fenn’s curiosity about each other and their tentative willingness to look beyond their cultural conditioning all the more special. This is Peree’s point of view. This book takes place a bit before Pereel is to meet the person he’s to keep safe from the Scourge while collecting water for both communities… But as you know more than protecting someone’s life is what Peree has in mind. You are going to witness his feelings towards Fenn (and since when), his relationship with family; and honestly, you will laugh, and be a but more surprised about this character. The book will tell his POV ‘til when he provides Fenn the rope for h This is Peree’s point of view. The book will tell his POV ‘til when he provides Fenn the rope for her swimming time. This is a must read for fans of The Scourge. Fenn is such a wonderfully written strong female character, and now in The Keeper, you get to follow the story from Peree's perspective. I loved getting to know Peree's character and learning more about his feelings. I can't wait for more and hope to hear more from Peree in the future! This novella gives us Peree's point of view. It's been quite some time since I've read The Scourge; what this book managed to do was remind me of why I fell in love with the book in the first place and to make me painfully homesick for these extraordinary characters. Cannot WAIT for the next installment! I know this is just a novella but what was written was just not enough. I absolutely love Peree but only getting a glimpse into his thoughts and how he feels about Fenn is torture. I want a whole book on his POV. Henley if you read these reviews please complete his POV of the first book. A post-zombie world where two communities have formed, those in the trees, and those on the ground. Each needs the other to live, and both must face the "seasons" of the dead. One girl who was blind from birth, seems to be invisible to the dead which makes her task in this society terrifying but mandatory. This 1.5 in the Brilliant Darkness series was free on Kindle. It's only around 40 pages detailing Peree's side of the very first few chapters in the story before he offers Fenn the swim. It's a quick and fun read, but it's definitely not necessary. I only read it out of curiosity because it was free and short. I really like the full size stories in this series, but this was kind of a joke. The story was nice - it's cool to have more sight based description as opposed to sound/smell based descriptions, and we all like Peree - but it just didn't add anything to the series itself. It ended at an awkward point and didn't really add to the character development of Peree. It was fabulous to read more about thud interesting group. There are some things given that weren't in The Scourge do having s different point of view was nice. Didn't have the same pull as book one but still a good middle book. Great addition to the series. I wanted it to be longer because I love Peree so much and probably would read a whole book with his POV of The Scourge. It was cute to see how much he liked Fennel before he even really met her. Can't wait for the next installment- the teaser at the end killed me!